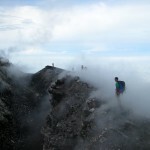 At the end of April we joined Java Lava for a trip to climb Gunung Slamet in Central Java. The travel novelty was getting the train from Jakarta to Tegal to start the hike rather than having to fly. Andy and I took the train from Bogor on Friday afternoon and spent a couple of hours at Gambir station watching the buildup to the royal wedding in a café. The train journey takes about 4 hours and was very comfortable in the AC executive coach with table service for drinks and food (better than a UK train journey any day!). For the long weekend at the end of May we decided to head to central Java to climb Gunung Merbabu and to take in the sights of Solo. We flew into Semarang on Thursday night and took a taxi directly to the hill village of Kopeng, where we met our trip organiser Pak Totok. It was straight to bed as we arrived late and we were aiming for a 5 am start the next morning. We dragged ourselves out of bed at 4.30 am and forced some fried rice down our necks before setting off for the trailhead in an angkot with our two porters. By 5.45 we were already on the trail. After about 15 minutes the porters stopped for breakfast; we knew then it wouldn’t be a record breaking climb in terms of speed. Andy and I hiked on ahead and waited at several points for the porters to catch up, including a 1.5 hour break with a nap at lunchtime! We learned our lesson on Tambora – don’t get too far ahead of the porters, especially if it looks like rain, as they might decide to stop for the day without bringing your tent to where you are waiting! The forest was pretty along the way, not too dense and as we got higher it turned into grassland with sparse trees. We got some good views of Gunung Sumbing and Gunung Sindoro to the west.